On Friday, China Labor Watch, a New York-based NGO that claims to be “dedicated to promoting workers’ fair redistribution of wealth under globalization,” announced that a “large-scale strike” had shut down a Foxconn factory that manufactures the iPhone 5. The group didn’t cite its sources for the story, but that didn’t stop several major news organizations (the credulous Reuters report was syndicated across multiple platforms) from parroting the press release, often verbatim. It was also picked up by several notable bloggers and commentators, including Henry Blodget, co-founder, CEO, and editor of The Business Insider. Below, a screen grab of Blodget’s Friday afternoon editorial. On first glance, the photo is the perfect complement to the headline: young Asian women in red sashes marching through a factory zone. 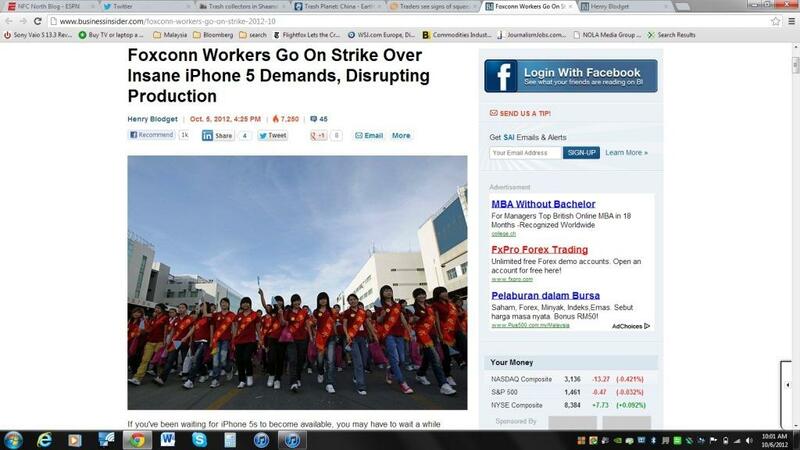 If they can’t stop iPhone 5 production, nobody can! But now, let’s take a closer look at that photo (you can click to the original, here). I’ve blown it up and grabbed a representative sample, below. Two things to note in this photo. First off, the characters on the red sashes very clearly spell out 奇美電子- Chimei Electronics, a company better known as Chimei Innolux, one of the world’s largest flat panel manufacturers. Now, as it happens, Foxconn is a major shareholder in Chimei Innolux, and it partners with Chi Mei to manufacture touch-screens. But Chi Mei is not Foxconn, and thus the above photo does not show Foxconn employees. Second, those who read the China Labor Watch press release will note that it describes a work stoppage. Now compare that to the photo: these girls are smiling, walking in lock-step, and wearing red sashes. Nobody is wearing a Foxconn uniform (for a sense of what those look like, see Rob Schimitz’s film taken in the Foxconn Longhua facility a few months ago), or any other kind of worker uniform. Rather, they’re in their civilian clothes, and they appear to be engaging in a kind of parade. Is it a parade in support of Chimei Electronics? Maybe, but admittedly I have no idea. But here’s the thing: Henry Blodget, or whomever he employs as a photo editor, did have an idea. And that idea, as tweeted by my friend Abe Sauer (who pointed out the photo and headline to me in the first place), goes a little something like this: “group of Asian people all walking in unison = protest action.” It’s not an uncommon way of thinking about China, and Asia, especially among commentators and correspondents with little to no experience interacting with Chinese workers. 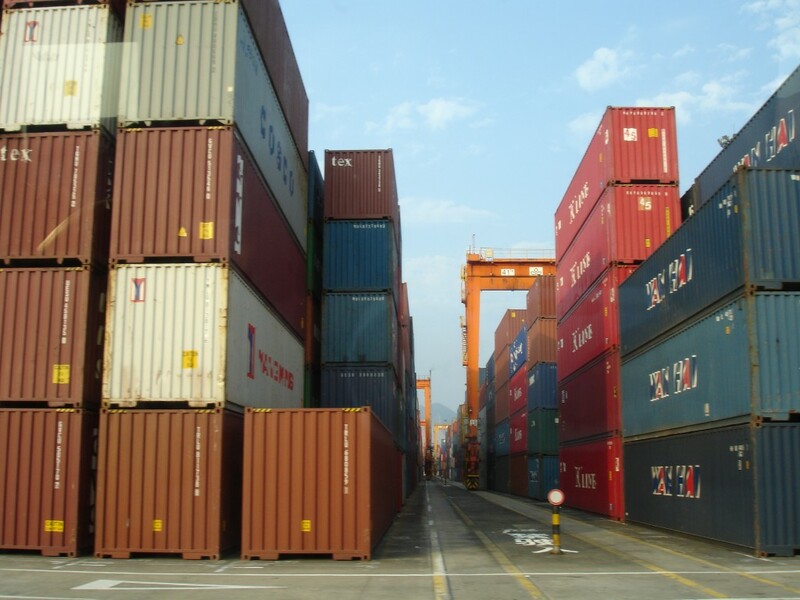 Nonetheless, common or not, you’d hope that organizations and individuals who aspire to some kind of role in commentating about China and its labor situation would have the good sense if not the dignity to avoid gross stereotypes (based on skin color, no less) and generalizations in their pontificating. Does this image strike anyone as depicting a strike or work stoppage? 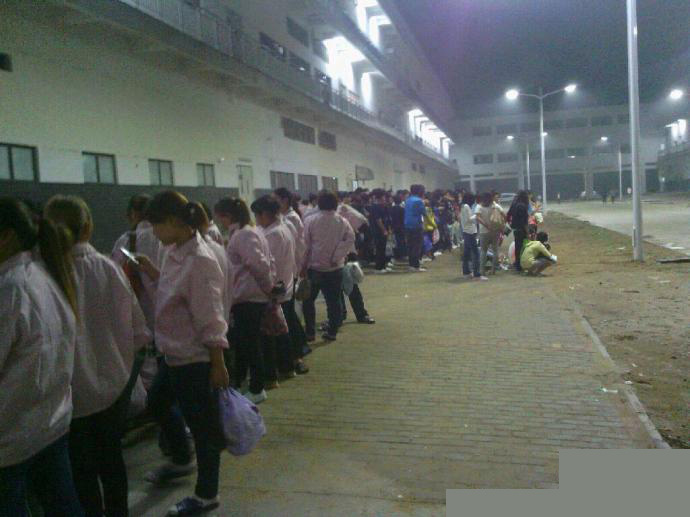 In it, workers appear to be lined up and awaiting something. Note the girl in the foreground idly checking her phone. What is she and the others waiting for so patiently? A bus to the factory? A bus to the dorms? Whatever it is, there’s little evidence in this photo to suggest that she and others are waiting for a strike. But that didn’t stop China Labor Watch and others from running the grainy image. They, like Blodget, appear to be under the impression that when groups of Asian laborers gather, they must be protesting. The truth is far more normal than that – unless, of course, you insist on viewing China’s factory workers as a perpetually persecuted class just waiting for a chance to rise up. But this has never been true, and is even less true now, as amply documented in several recent stories, of which Marketplace’s series, End of the Great Migration, is one of the best. Last week, in my capacity as a guest-blogger on Jim Fallows’ site at the Atlantic, I wrote a series of seven short blog posts, each accompanied by two photos (except for the last) showing a scene from Asia’s scrap recycling trade. My purpose was two-fold: first, I wanted to give Jim’s readers a peak inside of the often monumental scale of the industry as it’s practiced in Asia; and second, I wanted to challenge the oft-held assumption that people who labor in this industry, especially in the developing world, are exploited. That’s less and less the case, especially in China. 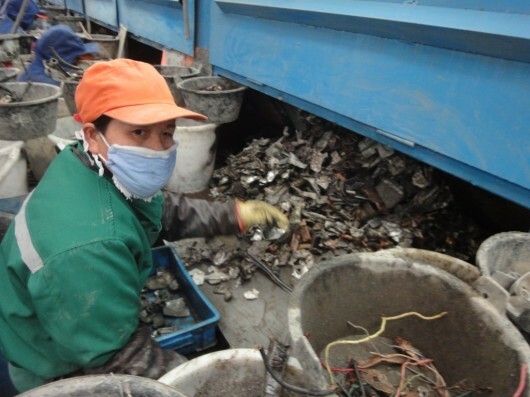 For example, the metal sorter in the photo can earn in excess of US$500/month, and have her choice of jobs up and down China’s East Coast – a blessed fate that eludes most recent Chinese college graduates. As I note above, they really do have an order to them, an intended narrative, that leads to a concluding argument about just who’s being exploited by the globalized waste recyclables trade. And that conclusion is, in part, one of the arguments that I’ll make in Junkyard Planet, my forthcoming book about the global recycling trade, to be published by Bloomsbury Press in 2013. The aging face of what we think of when we think of Chinese labor. Below, a photo of a metal sorter in Jiangsu Province, China. To those who don’t recognize what she’s doing, it may look like she’s sorting garbage. To those who do, they know that she’s a semi-skilled laborer who can distinguish different types of metal by sight and feel. That job description doesn’t generate much respect in China, or outside of it. Eight years ago, when I first started encountering workers like her, she was paid like it: between RMB 600 and RMB 800 per month (US$73 to US$97 by the 2002 fixed exchange rate). 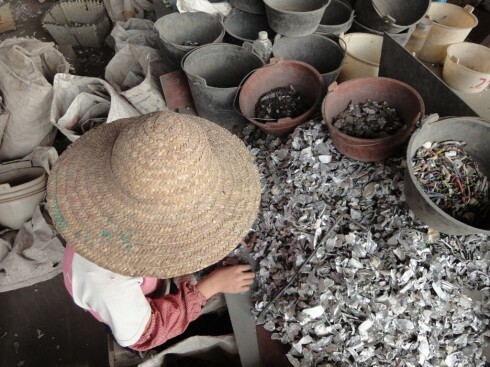 She was also younger: most of the hundreds of thousands if not millions of women engaged in this type of metal sorting were under the age of 30, unmarried, uneducated, and relatively local to the factories where they worked. Over the last several weeks I have been having a new, intense encounter with these metal sorters, and much has changed. The factories where they worked, once filled with the happy gossip of younger women, are now quiet, the sole territory of women in their late thirties and older, many of whom have remained single. Young women, the sorts who, ten years ago, would have flocked to these factories, are now migrating to the cities in hope of better jobs, and better lives. And so, in the absence of new laborers to bolster their ranks, China’s semi-skilled metal sorters have become highly sought. Wages, once so low that they could only be justified as decent in comparison to a farmer’s i ncome, have risen to levels that – ten years ago – none of these women could expect. In this factory, wages have risen by 20%, annually, for the last couple of years, and now average in excess of RMB 3000/month (US$441/month) – exceeding what most Chinese college graduates can reasonably expect to earn after graduation. It won’t last, though. The employers of China’s metal sorters, panicked at high wages, are investing in efficiency and automation designed to eliminate RMB 3000/month metal sorters. In a few years, there’ll be fewer Chinese metal sorting jobs, and – presumably – lower wages in the field. At least, that’s how it looks right now. Then again, eight years ago nobody was predicting the current bottleneck – everyone just assumed that there’d be plenty of cheap labor flowing from the countryside, into scrap yards, for years to come. I won’t hazard a guess as to where all of this is going. But it sure doesn’t feel stable – it sure isn’t the China that metal industry leaders told me I’d be watching in 2010. It feels much more unstable.